After a seemingly rough several months for business owners (where Facebook is concerned), it looks like there’s a bit of light shining at the end of the tunnel. Many business owners have scoffed at the algorithm changes that are keeping fans from seeing promotional content posted left and right. 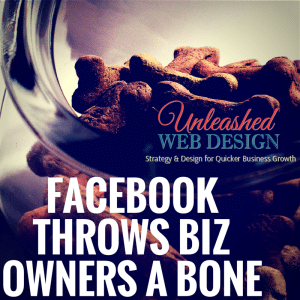 It has seemed for a few months that the Zuck has been trying to think of every way he can to eek out money for what business owners have been getting for free for so long on Facebook – business leads and marketing help. When it seems like you’re going to have to pay Facebook something just to have a few people see some kind of content posted by your business, either through boosting posts or placing FB ads, it’s nice to see that they are still doing something that will help business owners grow their businesses using Facebook – without having to pay to access it. According to an article I saw on Hubspot this morning, FB is rolling out a new feature where you can add a “call-to-action” button to your business page. That callout button can be used to encourage viewers to sign up for your newsletter, get right down to shopping, play a game, and a few other things. Facebook is even allowing you to take people offsite (away from Facebook) when that little button is clicked! I guess the biggest caveat is that you have to get people ON your Facebook business page in order for them to see the button. To read more about this feature that is being offered currently to a limited number of businesses, but will fully roll out in 2015, click here. Previous post: Are you in “the zone”? For goodness sake, get out of it.